With decades of experience in manufacturing high quality heat treating equipment, Charles A. Hones, Inc. designs, manufactures, and installs industrial pipe burners and more. A natural gas or propane pipe burner from the Charles A. Hones, Inc. can be customized according to the client’s preferences to ensure utmost satisfaction. Choosing the right heat treating equipment is crucial for creating the best products for your specific industry. Our stainless steel pipe burners are designed to be as efficient as possible. These are manufactured to produce the right amount of heat for any kind of application. Buzzer pipe burners provide a simple and efficient way to heat a large variety of processing tanks, ovens, and cookers. They can be used to heat large, small, square, rectangular, sloping, V-bottom, or any specialty tank. Pipe burners provide a very uniform heat source, spreading the gas flame over the entire length of the item being heated. 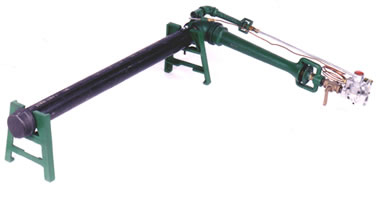 Photograph shows a 2″ diameter x 36″ flame length (6″ flame height) pipe burner with Venturi air mixer, 90O ell, cast iron legs and pilot, and safety valve (100% shut-off type). Base list price is $953. Same burner with a 72″ (6′) long flame is $1,184. The Hones pipe burner set pictured is ruggedly designed for even the most demanding industrial heating applications. 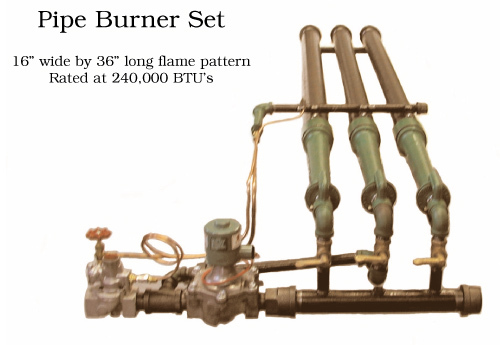 The burner package pictured will produce a flame pattern that is 16” wide x 36” long and is rated at 240,000 BTUH. 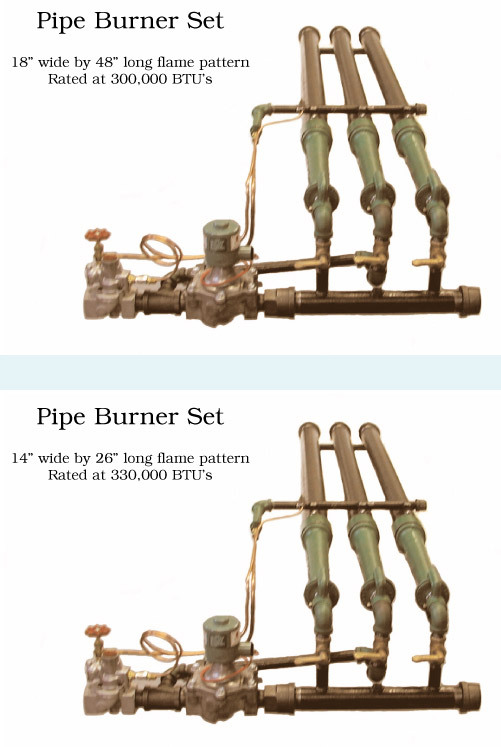 An almost limitless range of lengths, widths and BTUH outputs can be manufactured (ranging from 10” to 100” long or 5,000 to 500,000 BTUH) by Charles A. Hones, Inc. Packaged natural gas or propane pipe burner sets are ideal for use under a wide variety of kettles and tanks in both factory and commercial environments. Hones industrial quality stainless steel pipe burners are made in the USA. Standard burner pipes are manufactured using a combination of automated machine drilling and precision hand drilling to ensure accuracy and a professional appearance. Buzzer plain drilled pipe burners provide rapid lighting, a stable and uniform flame, a wide range of turn-down, and excellent on/off cycling for use with the latest flame monitoring systems and temperature controls. Our pipe burners can be set up to operate on either low pressure natural or propane (LP) gas, requiring only a simple orifice change to convert from one gas to the other. Our natural gas and propane pipe burners supply gas heat for tanks, kettles and ovens for a variety of industrial and commercial applications from metal melting furnaces & powder coating ovens to micro-brewing. Common applications include cleaning tanks, hot rinse tanks, black oxide tanks, quench tanks, food processing, low temperature salt baths, pre-heating, heat exchangers, boilers, ovens and flame treating. For more information about our natural gas and propane pipe burners, call us now at 631-842-8886 or email us at info@charlesahones.com. We are more than willing to assist you.